The Flagstone Heritage Trail and the Castlehill Heritage Centre between them celebrate the memory of the flagstone industry in this part of Caithness. Opening times for the heritage centre are set out on the right, while the fairly short and very pleasant stroll along the trail can be enjoyed at any time. 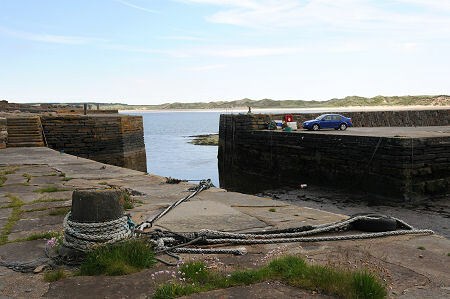 Both are reached by heading north east for a little under half a mile along a minor road from the centre of Castletown. The story of the flagstone industry in this part of Caithness is very much the story of James Traill of Rattar, Sheriff-Depute of Caithness and owner of substantial estates in the area. In the early 1800s he conceived the idea of opening up a series of quarries on his land. One of the most promising sites was at Castlehill on the shore of Dunnet Bay. Over the following 20 years Traill began the large scale extraction of flagstone at Castlehill. In parallel he oversaw the development of Castletown as a planned village on a greenfield site to house quarry workers. In 1820 work began on the construction of Castlehill Harbour, intended to allow the easy transport of flagstones from the local quarries to destinations throughout the British Isles and far beyond: Castlehill flagstone found use in places as far afield as South America and Australia. The first cargo of flagstones left Castlehill Harbour in April 1825: many more were to follow. James Traill died in 1847, but the industry he established continued to thrive. Its reached its height in the early 1900s, at which time 500 men were employed in the quarries at Castlehill. Peak production was in 1902, when 35,363 tonnes of flag were produced, worth £23,239. By 1920 competition from concrete paving slabs was dramatically eating into the market for flagstones, and the quarries at Castlehill closed in the 1920s. Not far from the quarries between the shore and the village of Castletown stood Castlehill House, built by James Traill as his residence in Castletown at the same time as the village was being developed. This burned down in 1967 and now stands as a ruin. 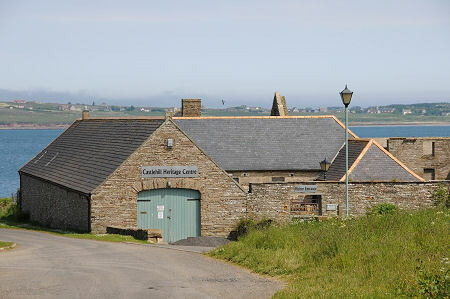 Part of a farm steading on the Castlehill Estate has in more recent times become the premises of the Castlehill Heritage Centre. This is run by volunteers and is slowly evolving as time and funds permit. This has an interesting exhibition area which focuses on the area's flagstone industry but also covers a wider range of topics of local interest. There are also regular demonstrations of traditional skills such as spinning, weaving, rope making and dry-stone walling, with visitors able to try the skills for themselves. Part of the centre is used for an ongoing archeological project with a public viewing gallery, while within the steading's enclosed square is a fine heritage garden complete with plenty of flagstone walls. The Flagstone Trail starts close to the Heritage Centre. It is fairly short in length, but very high in points of interest. The first port of call is the quarry itself. What can be seen at Castlehill is only one end of a quarry that at one time extended for nearly a mile to the south west. 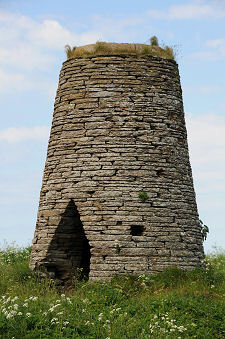 The most obvious building surviving from the quarry is the windmill tower. This had a head that turned to face into the wind and was used to pump water out of the quarry into a nearby dam until it was made redundant by a steam engine in the 1860s. From here the water flowed over a waterwheel, which from the 1840s powered saws used to cut the flagstone: until then all cutting had been by hand-saw. Structures associated with the dam, the waterwheel and the cutting yard can all still be seen as you follow the trail. Also still visible are some ruined cottages once used by some of the workers at the quarry, and the still active harbour. Like everything else at Castlehill, this is built of locally quarried flagstone, and as you look round today it is possible to imagine what a hive of activity this must have been as schooners were loaded by hand with flagstones. Nearby is Yung Dahl, a Wick registered fishing boat whose fishing (and perhaps floating) days appear to be over.